I was walking down a little street at the back of Euston Station and just loved the way the light and shadows turned this very ordinary wall into a visually interesting wall. The reflections in the car windscreen just added to the picture. You must be a career photographer, ordinary scenery comes to be great in your fresh eyes.Good! Nice views. Great photo! Euston is in quite an interesting area. Quite close to where I live in Hong Kong there was a castle called Euston and inspired by the Euston Fire Station. If I can find a photo I'll put it on my blog for you. Winter light can be so stimulating. The wall is very ordinary, even ugly, but with the shadows... a different story indeed. I like this pattern on the wall! Lovely shot. Funny how the simplest things can become great shots. Brick walls are never ordinary! 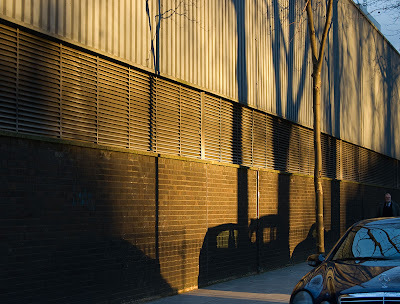 Winter shadows in the backstreets of Euston, who would of ever thought of that? Great photos. You obviously have a knack for finding an interesting aspect of everyday scenes. nice shot very warm!- did you see the london paper has an iconic london photo competition? u should check it out it finishes next week and is looking for an iconic london that only londoners know. and the long shadows on grey and brick fits the bill! That sunny light remember me to my city Madrid. Long light; friend to the photographer. But... not everyone would stop to really see this; you have a great eye. Gorgeouos shot. I would have stopped and taken this photo as well. We think alike! Of course it's my kind of image not just the wall but the branches reflected in the car too.You are learning well. Yo man i really like your blog i think that the pictures are really good and reflect london. I am a Media student and i am currently having to do a blogging projects using photos of london and myself. I was just wondering if u would give me a few tips and please look at my blog and tell me what you think. cheers dude. I love your blog- and this particular, whilst not as beautiful as some of the others, stands out to me. It's a very ordinary scene- but the light of this time of year changes it into an interesting wall which the imagination can use to full potential. An inspiring blog, and a noteworthy picture to represent our darling capital city. Keep up the good work. My goodness! What a lovely shot. You've a gift, you do! I just returned from London last week and loved your blog photos. I miss that wonderful city dearly! you have an interesting photographer's eye! this is beautiful...iv always dreamed of living in London. Is it nice? Very nice photo. The light just makes it. Wish I had your talent! Thanks for sharing it with us. Checking your photos brightens up an otherwise dull evening! These pictures are really impressive,there's kind of spontaneous feeling on them. What I really like is that you write some background information (like in the Piccadilly Circus and Shank's Pony entries), so it works as a London's "esthetic guide". I love the freedom of the photos, te reflection on life. wow. nice Click :) . You've arrived at the right time of day. I will definately agree with that. There is just something about brick that makes it more appealing. You know that actual work had to go into it. And it can bring a bit of history in some cases. Another thing I want to say is when I visited London, France, and Spain, it really opened my eyes in the history of those place. I live in America, and with just a history of 300 years or so, the places in Europe are amazing. Those trips gave me a whole new concept of world history. Thatwould be very dull without those shadows !!! !